The Beechwood’s were among the earliest white settlers in Neosho County. Jacob Beechwood, a French immigrant, farmed a claim two miles east of the Catholic Mission site and was described as a kind and jovial person—a man that made friends, not enemies. The Beechwood’s, including son Charley, left us with a very familiar landmark; and an iconic image of changing Kansas. Figure 1. Like the Osage Mission Missionaries and Many Other Settlers, Jacob Beechwood Was an Immigrant. 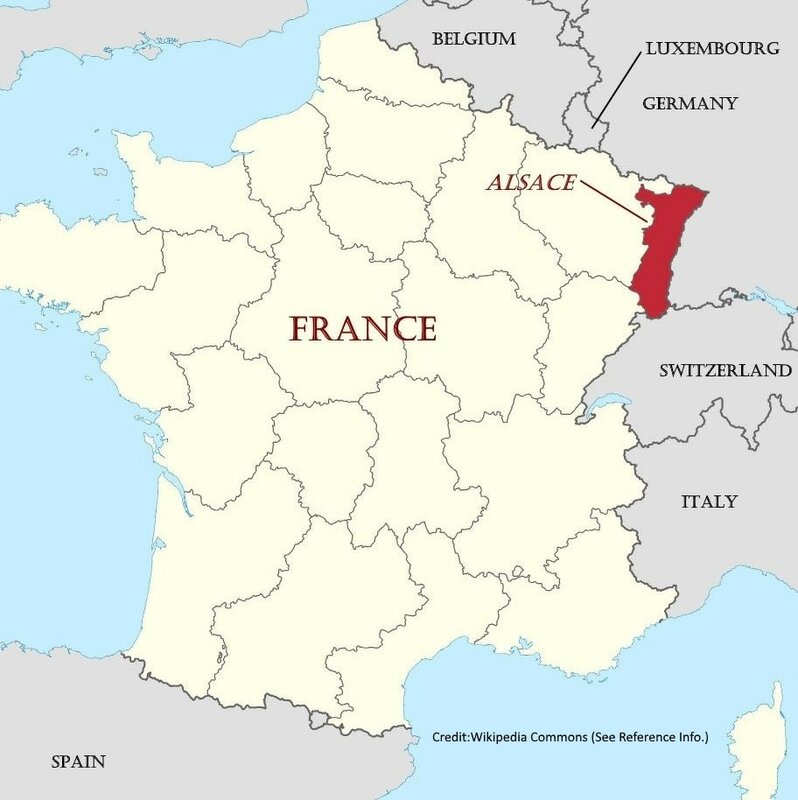 Jacob Beechwood was born in Alsace, then a province of France, on July 25th, 1810 (Figure 1). In 1831 he immigrated to America, landing in New York. It was there that he met his first wife, Elizabeth, Grosbeck. She and Jacob had four children before her death. He later married Catherine Gilman and they had four more children including a son, Charley. The story of Jacob’s move from New York to Osage Mission suggests the family had some financial means because he made two trips to Kansas before actually settling. Some settlers barely reached their destination. According to son Charley, his father made the first trip in May of 1865 traveling by train from New York to St. Louis; by steamboat from St. Louis to Kansas City; and then by rail to Fort Scott. From Fort Scott, he proceeded by foot looking for a location. Jacob returned to New York in July of 1865, holding a sale in September. Then, with his family, he traveled to St. Louis by Rail; and on to Kansas City by steamboat. They stayed in Kansas City for about ten days, hiring two teams to haul them to Fort Scott. They stayed in Fort Scott until late October, hiring a team to take them to Osage Mission arriving on November 1, 1865. On arrival, the Beechwood’s initially lived in a cabin near Flat Rock Creek. Then they staked a claim of 160 acres two miles east of the Catholic Mission site. Jacob hired a group of Osage Indians to help erect the family cabin. Charley saw deer, wild turkeys, and prairie chickens, by the thousands, all over this country. ​Both Jacob and Catherine are buried in Block G of St. Francis Cemetery. Kansas highway 47 is noted in dark red for orientation. The original Beechwood claim is blocked in yellow. At the time the atlas was published, the land was in the possession of William Beechwood’s Wife, Mary A. Beechwood[4 - sp]. The property south of the Beechwood claim, outlined in blue, is that of neighbor John Duling who also settled in 1865. John and daughter Mary Duling are also part of our story (below). First – the term “Osage Lands Certificate”. The 1865 Canville Treaty opened the eastern end of the Osage Reserve to white settlement and this was the first step in the total cessation of the Osage's Kansas land. Generally speaking, this area included present Neosho and Labette Counties and small strips of adjacent east and west counties . After long negotiations, the Canville Treaty was finally signed in September of 1865. When Jacob Beechwood staked his claim in November of the same year he was among the very early claimants. Second – The document is dated the first of June, 1869, about three and one-half years after Jacob staked his claim. Under terms of the Homestead Act, settlers did not acquire ownership of staked land immediately. They were required to pay a small filing fee; they had to improve the land by at least building a house, and they were required to live on the claim for five years. There were options to achieving residency earlier. Union soldiers could use their time served against the five-year residency requirement. Also, settlers who could raise the money could buy their claim at $1.25 per acre. The Beechwood’s must have raised cash for the second residency option. ​Son Charley Beechwood and the Mission Painting. An iconic image of the Osage Mission grounds has been attributed to Jacob’s son, Charley Beechwood. 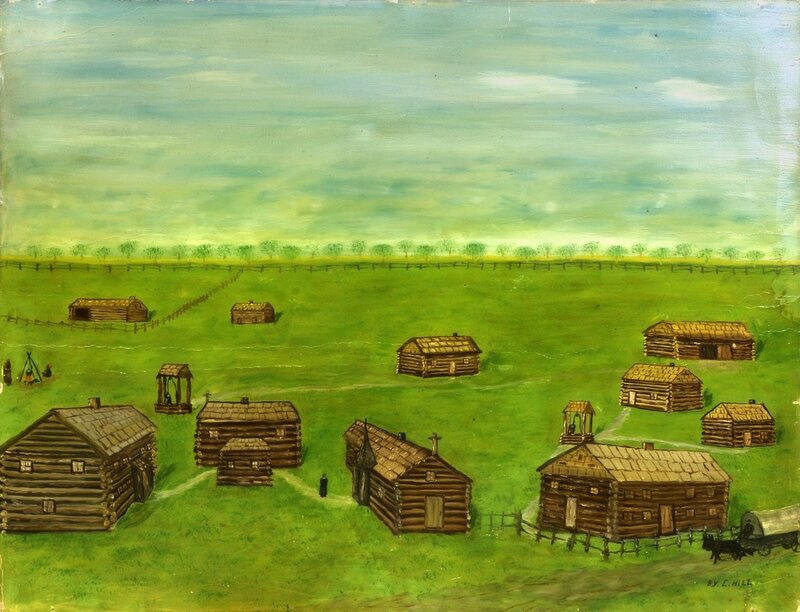 The painting depicts the ten buildings on the Catholic Osage Mission grounds at the time Charley became the first white student in the school. This was an important time of change in southern Kansas. The image denotes the entry of white settlers into our region at the expense of the departing Osage. Over the next few years, the Osage manual labor school buildings were replaced with new public and boarding schools. The painting freezes a transition period. Charley’s attribution for this image varies depending on the source. Some say he drew the image while he was a student at the school. That is unlikely because he was only nine or ten years old when he entered the school. After 1870, modern structures quickly replaced many of the mission structures. Other sources say it was drawn from his memory, at a later date, and this is correct (below). Local newspaper records show that Charley, and his brother William, enjoyed some success, but the details are hard to pin down. 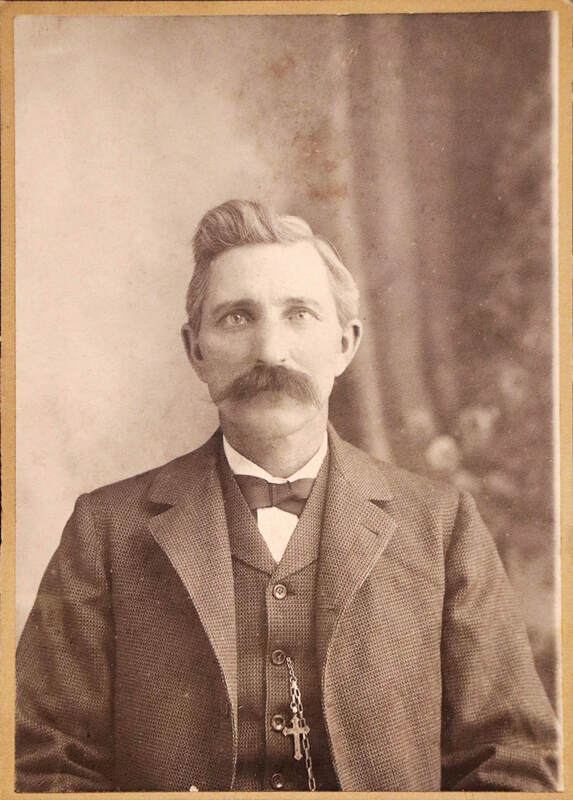 Sometime prior to 1898 Charley moved to Duneweg, Missouri and over the years he was associated with a livery business and mining. But the January 22, 1898, issue of the Neosho County Journal reported that “The Beechwood mining company has struck a rich vein of lead at Duneweg." After this, there are mentions of Beechwood Mines or Beechwood Brothers Mining in some trade publications including Excavating Engineering and Iron and Machinery World (1900 – 1916). But during the same time, there are articles about him purchasing property in Walnut Grove (Township) and moving between Joplin and Neosho County. As noted above, the 1906 Neosho County Atlas shows his wife’s name on the Beechwood Hill property. The article goes on to say the painting was made for the Kansas Catholic Historical Society and would be displayed in the office of W. W. Graves until January 1. At the time Graves was a founding member of the Kansas Catholic Historical Society which was based in Atchison. The society has closed but local information and artifacts remain in the care of St. Benedict’s Abby on the St. Benedict’s College campus; and Atchison is where we found the painting. Figure 5. The "Beechwood Painting" Captures a Moment When White Settlers Began Movement onto Osage Lands. After some brief correspondence with the Abby, we were told they had the painting and we drove to up Atchison for a viewing. Considering it was painted on un-mounted cardboard it is in good condition with a few cracks that are visible in Figure 5. The Abby shot digital images while we were there. The colored version of the image shows a lot of detail not apparent on the black and white or sepia images that served us for years. The lower right corner shows the small inscription—“by E. Hill.” Charley described his memories to an artist. Based on comparison of the painting with later photos and a map there are a few minor irregularities. But for a man of 75 to remember what he saw, and then disappeared, 60 to 65 years earlier he did pretty darned well . Charlie passed away in Joplin of July 19, 1935. Figure 6. Anna Duling Munding in Later Years (Click to Enlarge). As noted above, the property south of the Beechwood claim was settled by John Duling. The Duling family is also described as being among the first settlers in Neosho County. They also settled during 1865. John's daughter, Anna Duling, enrolled as the first white girl to attend the Catholic Mission schools in November of 1865. Anna Duling - Munding died in Muskogee, Oklahoma on August 17 of 1932. Jacob Beechwood’s Trip to Kansas, Kansas State Historical Society manuscript archives, Neosho County. ﻿Kansas Historical Society, Kansas Collection﻿ - A more readable transcription of the above information. The Beechwood Land Warrant (deed) is on file at the Neosho County Register of Deeds Office in Erie, Kansas. The Canville treaty was the first treaty releasing Osage Lands for settlement. For more information regarding the departure of the Osages, including treaty negotiations and land parcels follow ﻿THIS LINK﻿. Many of the Osage Mission buildings were demolished during the time frame of 1870 through 1880. The last remaining building was the original church which was razed in 1888. Follow THIS LINK (and sub-links) for more information about the original mission. The page-top banner photo was taken by Ron Brogan. 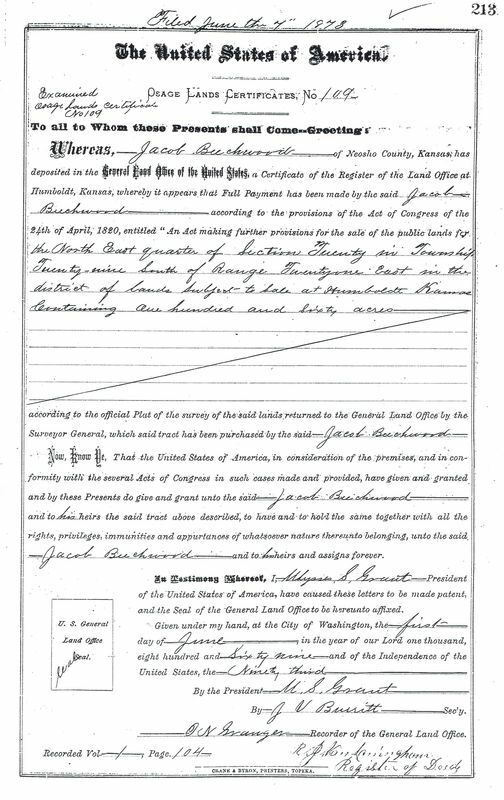 Land Documents, Figures 2 and 3 were acquired from the Neosho County Register of Deeds office and scanned for presentation here. The photo of Charley Beechwood was photographed from a print on file at St. Benedict's Abbey, Atchison, Kansas. The photo of Anna Duling Munding (Figure 6) was scanned from page 54 of Annals of Osage Mission, W. W. Graves, Indexed and reprinted by Graves Memorial Library 1987. Figure 5, "The Beechwood Painting," was photographed by the communications manager at the St. Benedict's Abby, Atchison, and a digital copy was provided to us. The origin of the painting is discussed above.